Blackfin brand stands for for quality and style. Blackfin titanium eyewear is handmade in Italy, using only hand-selected Japanese titanium, expert knowledge and skillful craftsmanship. 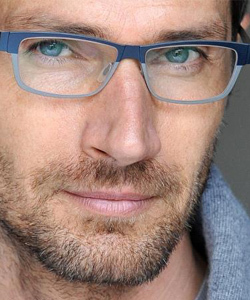 Non-allergenic, non-toxic and biocompatible, Blackfin frames are 48% lighter than other metal frames, and are created with passion and innovation. Blackfin frames strike a perfect balance between technical perfection and artistic style. The high quality titanium provides remarkable strength and resistance along with ultimate comfort and flexibility. With years of experience and inspiration, Blackfin has succeeded in creating the perfect design, harmonizing the technical and aesthetic qualities of the frames to create a frame that will fully satisfy if not exceed your expectations. Blackfin eyewear is truly unique and made to adapt to each individual face through specialized ergonomic manufacturing. The frames are created by hand, making each piece unique and different but giving a contemporary, cutting-edge image to every wearer. Through combinations of colors, shades and laser engravings each frame produces stand out aesthetic effects.